I like this version of the Last Supper because it is so real and natural looking. It is also from our time. There are little details that I really love, like the painting hanging on the wall and the different types of seating, as if whoever set the table had to scrounge to figure out how to fit so many people around this oddly-shaped table (which, by the way, was a brilliant compositional decision). Someone even took the time to put fresh flowers in a vase and it looks like there is tea for anyone who would like something in addition to wine. The guests have come from their busy work days and it looks like most of them have been unable to leave their own worries behind. Many are engaged in conversation. One has a pencil behind his ear and coins strewn on the table in front of him. Two are writing. One is holding a fishing rod. A chicken and a basket of fish are nearby. In fact, it looks to me like these guests are not ready to eat. Interestingly, the only one who is looking at Jesus is Judas Iscariot. You certainly made it clear who he is. Between the devil’s horns, the sunglasses that hide his eyes as he masks his true intentions, the spilled wine, and the tank with the 666 under it pointing at him, we are left with no doubt. But I am fascinated more with the other men. The fact that they haven’t for one moment been able to leave their workaday lives behind, and the fact that they are not even paying attention to Jesus, tells us so much. They simply don’t get it. They have no idea what is going to happen, what the significance of their gathering is. And yet, calmly, Christ is breaking bread for them. He has served them wine. He is giving them his body and his blood, his very life, and the only one who seems to notice is the one who will betray him. It’s an undeserving bunch. As are we. But we know that they are still invited to eat and drink the bread and the wine. They are loved and forgiven. 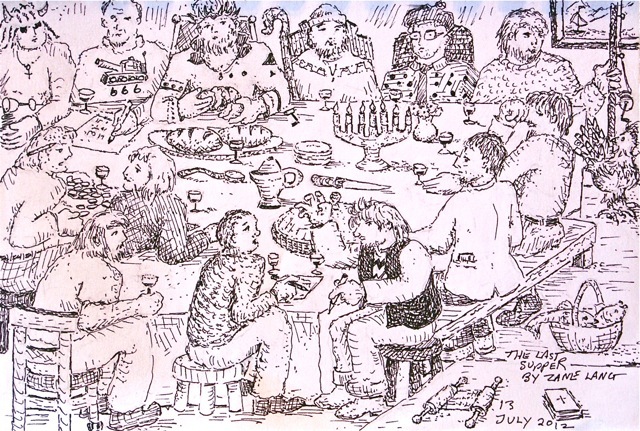 Zane Lang: The Last Supper, 2012, drawing on paper. Zane Lang (1957-2012): ‘I was born in 1957, twenty days before the first spaceship, Sputnik, was launched. I enjoy watching the stars.’ He grew up in Zimbabwe and studied Fine Art in Pietermaritzburg and then taught in Durban, South Africa. Like some Old-Testament prophet or a modern urban shaman, Zane left the city of Durban in 2001 and went to live in Botswana, where he ventures into the open spaces of the desert and expresses his visions and experiences. He died of cancer in 2012. Mary Abma is an artist from Bright's Grove, Ontario, Canada. She corresponded with Zane in the last few months of his life. Much of the correspondence was about Zane's art. This meditation is one of a series based on drawings Zane did while in hospice. You can view Mary's art at http://www.maryabma.com/.